When a prospect visits your LinkedIn profile, you only have a few seconds to grab their attention and make them want to learn more about the products/services you offer. This is why your LinkedIn background photo is such a critical piece of real estate on your LinkedIn profile. The background photo is the area that you see in behind your profile photo. And, by default, this background photo will be a standard teal blue “network” image (like the one you see below). Unfortunately, many people don’t update this image because they either don’t know it’s editable, or they don’t know what they should put there. 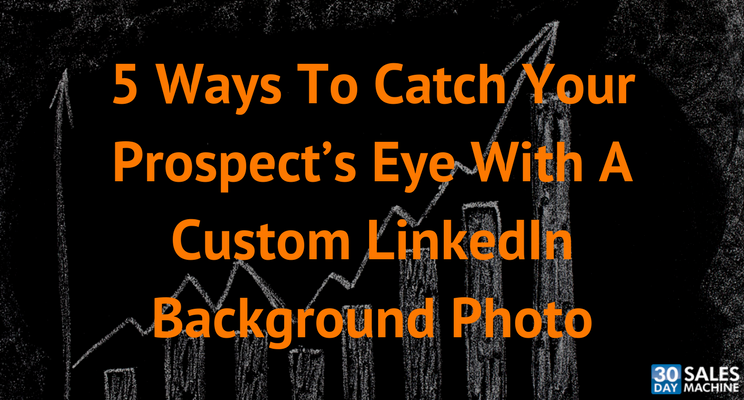 This article is going to show you 5 different ideas you might incorporate to create an “eye catching” LinkedIn background photo. Before I show you some examples of different LinkedIn background photos, let’s talk about how to update it properly. Firstly, you can change the photo by simply clicking the “Update background photo” link to the right of your personal profile photo. And you can see on the screenshot that the standard size is 1584 x 396 pixels. So if you're going to create your own (or have someone do it for you) you’ll want to make sure it’s sized appropriately to fit within the parameters of the LinkedIn profile. And, another thing that you can do once your photo is updated is reposition it so that it actually fits the space properly (and isn’t obstructed by your profile photo). Here’s an article on LinkedIn that explains more about the standard sizes, file types, etc. And, for more information about HOW to create a custom background photo like the ones found in this article, check out the free training at the bottom of this page. What Should Your Background Photo Include? This article is going to address 5 different types of background photos that you can mirror for your own use depending on your business, industry and role type. First, let me start by saying that I highly suggest that you use a “pain point” background photo. The reason being is that if somebody visits your LinkedIn profile, you want to grab their attention and this is a great way to do it. And, this statement is intended to elicit a “pain point” that the visitor might be experiencing. Q. Do you know what separates the businesses that succeed from the ones that fail? By asking a question and providing an answer to that question….my goal is to grab the visitors attention and make them want to read more on my profile. Here’s another example of Camille Buchanan Nisich’s LinkedIn profile. Again, this statement is intended to elicit an emotional response. One that her target audience can relate to. And, of course, she also addresses a deeper meaning to this statement by including additional explanations as to how she can help alleviate this pain point on the image. He also chose to include the CPA logo to showcase his professional designation and shows all the different types of industries that he works with. If including a “pain point” in your LinkedIn background photo is not your thing, another alternative would be to include some “social proof” (if you have some to brag about). Traci Bild’s LinkedIn profile is a great example of this. She included a number of media logos in her background photo that showcase all of the publications she’s been mentioned in including Success, BBC, Inc, Fast Company and Huffington Post. Including these logos in her background photo displays her credibility and instantly instills trust with any prospect that visits her profile. And, for all of you published authors out there, Greg Chapman’s background photo is a great example of how to incorporate your book covers into your photo. Greg has written a number of books in addition to being an accomplished business coach. He also chose to include a collage of keywords that I'm assuming help summarize the outcomes that he provides with his services. This is a great example of how an author might design their background photo to stand out from the crowd and showcase their expertise. Another idea you might want to consider is a “company branded” background photo. At it’s simplest, you can incorporate your company logo into the design. But, even better is the example listed below. Hector is a realtor that specializes in helping his clients find their dream home in Huatulco, Mexico. And, the sunset beach photo that he uses for his background perfectly represents what his buyers can expect when they purchase a property with him. The fourth example I have for you is the “industry specific” background photo. In this example below, Nelson chose to include an image that represents the financial industry. While this example is not the best one to choose in my opinion, it is still better than keeping the default “teal” background that Linkedin includes on your profile. In this case, instead of addressing a “pain point”, she included a statement that speaks to the value she can provide as a franchise advisor. And, speaking of that, there are a number of other ways you can create an irresistible LinkedIn profile that will have your prospects reaching out to you. If you are interested in learning more about all of the ways to improve your LinkedIn profile, make sure to check out my “7 Step Process To Create An Irresistible LinkedIn Profile That Will Attract Your Next Client” training video series. Sign up to receive the step-by-step training videos, implementation worksheet and cheatsheets that will help you create a LinkedIn profile that will have prospective clients beating down your door to work with you!